xo ♥ amela: Watch out for me, I'm about to glow! Watch out for me, I'm about to glow! You thought this post was about metaphorically glowing in life? Well, you're wrong. I mean, I could do a post on it, but we will save that for some other time. Today, we're talking about makeup! 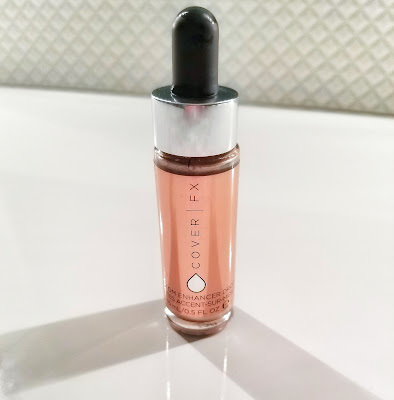 I love using highlighters and making myself glow as much as I can, but I wanted to share one little bottle that I use that really enhances my glow and helps me achieve that. It's called Cover FX Customer Enhancer Drops in the color Moonlight. 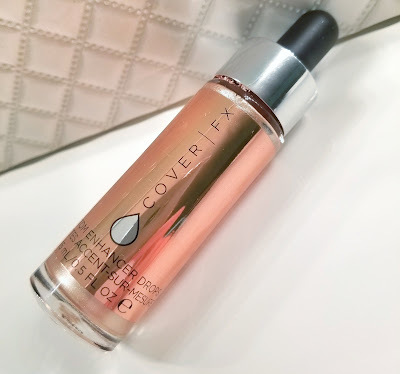 This little guy helps a LOT if you are wanting a glowing or dewy look. I, personally, am into matte's 24/7, but I mixed a little bit of this into my foundation one day and I was glowing. I looked really dewy but not oily. It was absolutely amazing. What I first started to do with it, was put it on top of all my makeup when I was finished and highlight it on my cheekbones. I would then blend it out with a damp beauty blender and pat down with a highlighter, usually the Jaclyn Hill Champagne Pop highlighter. I would then blend it out with a beauty blender again to make sure it has set in. You can still do this method and I can assure you, your cheekbones will be poppin. What I have started doing more recently was mixing it with foundation on the back of my hand and then putting the mixture on my face. I have found that this really brings out the dewy look. I only do this sometimes, as this little guy is $46 and it is quite a small bottle. It probably is a little bigger than my palm, so I try to use as little as possible. Also, a little bit goes a long way. If you overdo any of the drops, your face will end up being sparkly and not dewy. Trust me, I've done it. I recommend this product and would purchase it again if I could. I chose Moonstone, just because it seemed to be the most universal color, but you can go through and pick through 10 different colors to see which one will look best on you. If you are wanting to use it, I caution you to use very little at first and then you can see how it looks and add more to your liking. This product is very well put together and is of really great quality, so that's why the price is so high. To be honest, this is absolutely unnecessary if you already use a really great highlighter, but if you are wanting to get an even more glow, this is the product I would recommend for you.